Just before the end of July I was talking to a friend about my month off from blogging in August. Having mentioned that there is usually little news worth talking about over the summer, he made the comment that I’d probably find that all manner of things would kick off for once. He wasn’t wrong. The last few weeks have been challenging faith-wise. When you see and hear about such extreme depravities that humans are capable of, it’s hard to work out where God is in all of this. At times it has felt like the world is imploding on itself as the dehumanisation and hatred for others repeatedly leads to the slaughter of innocents and humanitarian crises on an unimaginable scale. The thirst for power and control has been terrifyingly demonstrated, whether it be through blind and twisted religious dogma or nationalistic bitter envy. Even in our own ordered country that is proud of its history of just governance, hundreds of the most vulnerable children have been horrifically abused whilst those in authority buried their heads in the sand. Somehow trying to make sense of this is harder still when you are surrounded by thousands of Christians worshipping God passionately singing about joy and God’s unfailing love for us. As I was standing there in the middle of a multitude of fellow Christians at this summer’s New Wine festival in Somerset I repeatedly wondered whether I would be able to worship God with the same enthusiasm if I was living in constant fear that my community would be massacred because of our beliefs. How can I write about God being good and talk about following Him when others believe that they are following God’s commands resulting in their unwavering desire to wipe out any who do not convert to their way of thinking? Thank you Gillan. You have so eloquently put into words much of what I have been thinking and feeling this summer. All of these things must cause anyone to doubt. But without God, where is the hope? I think that recent events (actually, events since the beginning of time) have shown that even if there is a god, he shows total indifference to his creation. There are many, many words in the bible about how special we are and how much god loves us, but where are actions that prove this?? I’m talking about tangible proof of a loving god?? I’m afraid there isnt any, god seems conspicuous by his absence. You’ve been missed my friend, and praise the Lord for your healing – He’s ace at medically impossible stuff! I recall hearing Canon Andrew’s account in July in Plymouth about Iraq and how the people’s love and deep intimacy with Yeshua enables them to know His Glory, which enables them to continue. That Celebration’s theme was the Glory of God and Andrew delivered deeply touching accounts of how wonderfully it exists in the midst of intense suffering. Exceptionally heartening. It is easier to believe and love Jesus when everything is happy and healthy. I have prayed for half his life for our son who has schizophrenia and autism. His health has been up and down and our lives are a roller coaster. He has had all the anti-psychotic drugs there are but still no cure exists and for him no miracle. Still I have never stopped praying for him. Sometimes I feel God is not listening, sometimes I feel strengthened by His comforting words from scripture. But even though my son may never be cured, I will still believe and hope in the Lord. Setting anecdotal self-reporting of miraculous cures to one side for a moment, can anyone point me to scientifically conducted and peer reviewed studies of faith healing? It would be interesting and informative to see what actually happens in these cases rather than forming an opinion based on the emotionally charged and often eye-popping claims of individual devotees. A “medically impossible” cure is a huge claim that needs to be backed up by some pretty convincing evidence. Otherwise you run the risk of being dismissed as an ecstatic fantasist. Having met many ecstatic fantasists during the course of my life, I know that ecstatic fantasy is not an uncommon phenomenon. Miracles on the other hand, by which I mean truly inexplicable events rather than subjective and selective accounts by overwrought believers determined to prove that their god is the best or only god, seem to be relatively rare. I think this is where Christian evangelism fails quite spectacularly in our modern world. Requiring rational people to accept miraculous claims without question or investigation speaks of a monstrous egotism: “believe what I say no matter how outrageous my claims because God and me are really one and the same and I therefore cannot be questioned.” This is the attitude I systematically encounter amongst Christians, especially those in leadership positions. It leaves me with a very negative impression of their faith. Also, and please don’t take this the wrong way, but why would god fix a back and ignore war, disease and pestilence? ??? Sorry but I just dont get it!!!!! I’ve asked the same question myself. My observations are that God works mostly in the lives of individuals when it comes to miracles – at least as much as we can tell. Miracles are more about revelation than healing or intervention for the sake of it. Change comes through transformation of minds and hearts. God certainly isn’t a slot machine doing miracles to order. If God were to solve war, disease and pestilence, it would provide substantial evidence for his existence. For some reason, God is either incapable or unwilling to provide such evidence. Given that incapable (because he/she/it/they) don’t exist is a far more reasonable and sensible reason than unwilling (considering he/she/it they) are supposedly all-powerful. This is why I am an atheist. God could easily proof of his existence, but consistently fails to do so. We should always question. If you’re not willing to allow that, it suggests you have something to hide or that you are afraid that you will be found wanting. There are enough doctors who have seen patients who have been healed miraculously. It would be good if someone had the time to do a proper study of this. This is quite interesting!!! I have looked at alot of research on prayer and healing (to much to list here) but what it tends to show overall is that it tends not to make a difference, and that supernatural claims are often unsubstantiated. Convincing evidence of miracles? The trumping criterion has to be financial. As stated on a previous thread on this blog, my wife surrendered the living allowance for being OFFICIALLY REGISTERED as PERMANENTLY DISABLED when she was healed. That COST US £60/week but MUCH BETTER to be able to walk. As a fraud investigator said, her refusal to receive entitlement is ABSOLUTE PROOF of physical healing! And as the doctor confirmed, it’s NOT PLACEBO EFFECT because that’s psychological not physiological!! It’s pathetic and pitiable that people who suppose they’re intelligent just cannot grasp such simple facts. Or is it a brand of bigotry? PS – as mentioned previously: it means I’m no longer a 24/7 carer – now THAT’S’s NOT FANTASY and something to be truly ecstatic about. Therefore, all that cynicism is outrageously churlish (or sub-human?). Hi Richard, we have had this debate before and I know you understand my reasons for not believing in supernatural healing. People are allowed to have differing points of view, based on their own journeys. This does not make them less intelligent, cynical or churlish. You have seen evidence for healing, I have seen evidence for lack of it. Does that make us right or wrong??? All I know is that when I look at the bigger picture, the evidence just isnt there. It hardly needs pointing out, but your financial arrangements following a cure aren’t proof of anything. Either God decides to miraculously cure some people (only to let them die later anyway), but doesnt bother to help millions of others, or sometimes people just get better for no known reason. I can’t make much sense of that either way. So one man’s anecdote is truth for the whole of mankind, is it? As much as I may want to believe in crystal whalesong organic shiatsu, I’m inclined to believe Gillan and Richard’s accounts of healing and Hazel’s account of determined faith in the face of a lack of a similar miracle. It does marry up with the character of Christ who healed a few individuals and neglected to solve huge problems (like Roman occupation). That such a statement draws criticism while people like Richard Dawkins thrive (even when they make outrageous statements) just proves that we still live in a ConDem nation in which cold hearts thrive. Sarky, Stephen, Tony – my use of financial terms is ‘holy in order because accounting is the basis of biblical belief. That is, we’re credited with life, talents and relationships and choose how to use them and whether or not to believe in our maker and saviour. In the end we give our account to the accountant and win or lose depending on our following his instructions. A better and more fitting analogy is being in court as judgement and rulings where made on evidence. Eg. were I suing on grounds of my character being slandered in this and other threads of this blog, I could prove I’m not a liar as claimed by one or all of of you. A court would accept documentary medical and financial records, physical demonstration plus statements of many witnesses as being incontrovertible proof. I’d win and you’d lose – hands down! Just one? Nah, there’s many, many more documented cases, especially the renowned one of Delia Knox paralyzed from waist down for 22 years walking and dancing, as seen by thousands. Just because many haven’t yet been healed supernaturally doesn’t mean people are not. To deny plain, factual evidence is sheer, irrational folly. No wonder Jesus laughed out loud that his heavenly father’s pleasure is to confound those who are ‘wise’ in their own sight. Richard, I have never doubted for one minute that your wife recovered!!! What I am skeptical about is the supernatural element. Like I said to you before I have an atheist friend who should be dead from cancer, I also have another friend who should have been in a wheelchair 20 years ago, due to a spinal condition, but still cycles everyday! !!!! People do get better!!! Just because you want something to be true, it doesn’t mean it is. Dr’s look at why we get ill, not why we get better!!! As for Delia knox, she has so far refusrd to release her medical records for before and after her accident, but it is known she had a head injury not a spinal injury, so again I remain skeptical. why we get better! !!! Who do you think is the Auditor/Chief Accountant? I can think of many people who lived their lives to the full, made exceptional use of their talents, but did not believe in your god and probably never even heard of him. Sarky – my reply got added to end of thread for some reason. 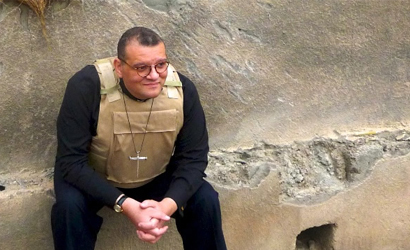 Hearing Canon Andrew speak in Plymouth about Iraq was heart-rending yet heartening when he told how the people’s deep love for Yeshua brings His Glory and intimacy, and how it enables them to live through exceptionally intense suffering. Political blogger Gillan brings his own spiritual insights in trying to grapple with genocide. He expresses surprise over things hotting up during the ‘silly season’ of August – but that’s exactly what many have been prophesying for years, especially in recent months (eg. June http://wp.me/p1Y1yB-5e8) This acceleration in biblically related events was noticed in 2011 and watching its increase was the reason for starting this blog. this is an exceptional commentary. I will reblog this for tomorrow’s post. Glory to God in the Highest and on Earth Peace (PLEASE) and Good will toward all men. We can must pray to intercede that evil will be thwarted. In reply to Nick. I too don’t really have a problem if that’s what you believe. However, where I have a problem is where healing is used as an evangelism tool, that offers false hope to people with very serious conditions. Too many times I have heard stories of people stopping or refusing treatment in the fslse belief they have, or are to be healed. This really isnt fair is it??? Christian tv channels are full of this stuff and even request money for healing. How is this right??? If you believe in healing, fine. But don’t use it as a stick to beat others with. Surely it should be personal between you and your god??? Extraordinary claims require extraordinary evidence!!!!!! Hi Sarky, you are correct and this kind of manipulation is a huge problem in the Church. “Surely it should be personal between you and your god?? ?” is absolutely the right thing to say. And you are correct that many Christians will refuse good medication in the wrong belief that it is an act of faith which will ensure their healing. I’ve even seen people ask for money for prayers but a lot of this is related to the prosperity gospel which is a truly terrible thing (and you wouldn’t believe the weird spiritual stuff which is involved with it!). It seems to be linked to some powerful and manipulative people within the church. And it isn’t right. But there is still true healing. Some time ago I stopped telling people that Christ would make everything wonderful for people. I looked at my own life and found that this wasn’t true. In the end I had to decide whether I thought that Christ could make things better for individuals. It has become my conviction that God can make things better for people (even if there is no healing). That is why it is my conviction that the country (and other countries) need God. I believe that the way to make things better in this country is for there to be a Christian revival. I find that the people who oppose this tend to have livelihoods which would be lost if it ever happened (e.g. drug dealers). No-one looks at the socio-political implications of a revival. And it has happened before so it can happen again. It is the people who personally have something to lose from a Christian revival who tend to be vitriolically opposed to it. In theory the atheists and secularists could at least be sure of a more lively debate about things they are interested in. Most Christians don’t want to attain power and change laws from the top. We want things to get better for everyone. As you write off the qualitative evidence of healing on this thread from Richard and Gillan earlier I don’t have much hope that providing quantitative evidence of the livelihoods of those who oppose revival will persuade you on this point either. But I wouldn’t have thought it took a rocket scientist to understand that people oppose Christian revival if they believe it threatens their employment or income in some way. There’s a difference between saying that a. people whose livelihoods are threatened by it oppose Christian revival (ie what you just said) and that b. “people who oppose Christian revival tend to have livelihoods that would be lost if it ever happened” is what I originally replied to. I assume you CAN see the difference. Hi Nick, bit confused!!! On the one hand you imply that christ cannot make everything wonderful and then talk about revival???? As ive got older ive realised that things will be as they always have been. Nothing really changes. If you use history as a guide, then revival is something to be feared not embraced. I think everyone wants things to be better, its not exclusive to one group or another. Unfortunately power corrupts, so even the best intentions get poisoned over time (again, just look to history). All you can do is try and be the best you can in your own little world and realise that you, your faith or whatever are pretty irrelevant in the grander scheme of things. We-ell. None of us have ever lived through a revival in this country so aren’t we all just going on what other people have said? We’ve just heard about it in history (and sometimes, for strange reasons, not even there). In my opinion, it can’t make things that much worse because things are so grim in so many ways for many people today. I think a revival would make things better for most people. A revival would effectively cause a lot more social action for existing charities. People would be more enthused to help others and less isolationist, less selfish. If Christians are God’s hands and feet then we could expect an increase in Christians to mean that there would be more charitable giving and that more people would be involved in helping others. There are many reports of past revivals increasing social action and the foundation of charities – the crime reduction is debated and often credited to Government, but it has happened before. There are also supposed to be more miracles during a revival. Some historians do oppose past revivals. Some say that the Wesley preaching and resulting revival among the poor stopped a revolution from occurring and that this would have been a much better thing. But perhaps, as you say, we can’t really change the world. Some of us even struggle to change ourselves. It may not even happen in our lifetimes. But is it really something to be feared? There would certainly be an increase in love. Even if you don’t believe in God you would have to admit that there would be more love because you know that Christians are commanded to love others. But not even all Christians want a revival – some Christian leaders oppose it (because it means there would be too much work). It’s just something which I personally believe is a solution to many, many social problems. Anyone who considers this has to decide whether it would make things worse of better. My belief is that freedom would be increased and that the poor and marginalized have lives which improve. There are a few losers in revival – that is why many politicians and people in power oppose it. Others will oppose it because they fear they will lose their jobs or lose out in some other way. But drug-dealers can retrain and reform, politicians can adjust. There would be more freedom – because at the moment there is so little freedom and we are so brow-beaten by many people with power and influence and sinister agendas. Perhaps it would all become jaded in the end and become a manipulative thing. But you have to admit that none of us in this present generation actually know that. And in a way, it would be a matter of trusting in God. In the meantime we are stuck trying to do the best we can and retain some kind of individual integrity. I just think things could be so much better for us. We’re going to be afraid whatever happens. Hi Nick, you paint a very dark portrait of things that I just dont see. I think you, like alot of people, take there worldview from the media (bad news sells). I see so much good stuff about, but this never gets reported. Believing the world is a dark scary place is a bit of a self fulfilling prophecy. The world is a wonderful place full of opportunities, dont fear it, embrace it!!!! It wasn’t that dark. You didn’t see the good stuff in my last post. What about miracles? What about countries getting healed? What about people dreaming dreams of the future and seeing visions? What about healings? What about social problems being relieved and people’s lives getting better? What about an increase in love? What about angel visitations and sightings of the risen Christ? These things are part of the world in which we live too. Or if they are not at present… they should be. The crime reduction has been very credibly linked to the removal of lead from petrol. So the credit in that case would go to politicians and scientists. Possibly. We know that the surprise reduction of many types of crime in the face of an economic depression is hotly debated. One way or the other the politicians tend to take the credit for this. Errrrm, so the good things in the world are supernatural and cant be proven???? Prehaps the world would be better if we opened are eyes and dealt with what was actually in front of us. Just a thought!!!! Well, not all the supernatural things are good. Take the devil for example – he’s a bit of a violent git. Yeah but he’s responsible for a lot less deaths than god in the bible!!!! Go ahead and defend the devil why don’t you? Sorry Nick, but I cant defend something I dont believe in!!! Still doesn’t alter the fact that god killed millions in the bible, but the devil less than ten. They say the devil is the great deceiver, prehaps you have been deceived and that god is the one to actually be worried about. Would explain alot. Hmmmmmm. Sarky, I know you didn’t but others have impugned the one who died for us, which I take great exception to. It’s utterly fantastic for your friends and everyone who gets healed one way or another. Naturally, the most interesting part is what brought about the change. When it happens immediately as an obvious consequence of something we want to consider the mechanics (physical or metaphysical), but most folk’s understanding is limited about the rationale, even more so on the spiritual dimension. So it can all remain a mystery. A devout friend of ours returned from the Io’Man and became completely paralysed in great pain from a ‘virus’ and remained so for a couple of years until she went ‘home’. Re Delia Knox. I mentioned her because I’d discovered ONLY that day that one of my teachers has been a personal friend of hers for many years, and were in wheelchairs together. I’ve just spoken to her husband who confirmed my knowledge that medical records in Alabama remain confidential by state law. Also, that you are misinformed and, as we know from interviews by other friends, her calf muscles were severely atrophied so it took a while for them to be rebuilt and gain strength and enable her to walk normally in high heels (on video). In view of that timing, perhaps God’s telling you something through this? We’ve witnessed what God can do, as did the early disciples. It’s your choice whether or not to believe believers’ testimonies of His goodness and grace. He’s more than ready to meet you more than halfway because Jesus’ blood has cleansed you from sin and enables you to be reconciled with Father and relate to Him direct. I’m sorry Richard, but you may believe you have witnessed what god can do, but this is greatly outnumbered by the times he does nothing. As for being cleansed of sin, I’d rather not!!! Sin has given me one hell of a life!!!!! I am very happy in my unbelief and thats not going to change. I have spoken and debated with many many christians over the years and not once have I been offered a convincing reason to think christianity is true or that it can offer me anything. We are always going to disagree, but it is always interesting!!! I’m sorry to say your great ignorance about the power of desire, words and declarations leaves you extremely vulnerable. You’ve made an official personal statement about your pre- and post-mortem life. That is, you’ve prophesied ‘hell’ over you, in other words cursed yourself. More fool you, for there’s none so blind as those who won’t see. You’re unable to grasp it’s not about reason but about your spirit man, whom your sin has stifled if not suffocated….it needs to be freed to be your real self and only Jesus can do that. ps ‘truth above’ should read ‘truth above all’. Wow Richard where to start!!! Just like to say though that as someone with the curse of hell over them and a suffocated spirit, I’m actually doing ok. I know you write with the best intentions, but it is this kind of stuff that confirms my atheism!!!! Those closest to me are the only ones whose judgement matters to me and needless to say they all think I’m great!!!!! So, 25 years today I knew I couldn’t have been more wrong. Hence, I do know what I write about, and avoid wasting valuable time on stuff I don’t know in detail or have experienced. Hence my serious advice – the choice is yours, as ever.